Built especially for Pub or solo performers and public speakers the POWERPOD 408 has the power and features necessary for providing clear, clean sound to the audience. With 4 channels that accept either XLR or 1/4" inputs, any microphone or other line input source can be accommodated. Also features 2-band EQ, RCA tape inputs and built in digital delay. 120w @ 4ohms. Six balanced mic inputs and eight line level inputs with a maximum output of 150 Watts @ at 4ohms. Separate tape input provided for playing tapes, CDs. Built-in digital delay with a rotary fader provides adjustment of time delay and repeat of delay effect Precise 2-band equalizer provides up to 15dB cut or boost for LOW and HIGH frequencies on each channel. Ideal for small club and bar, karaoke, school or youth club applications. The POWERPOD 620 shares the same number of inputs as POWERPOD 615 with an adjustable digital delay built-in but with the addition of a 7-band graphic equalizer. Power output 100w/ch. POWERPOD 620 is a good size mixer with power that is simple and effective! Since its introduction in 1998 has proved to be an excellent choice for musicians and venues alike. It offers power and flexibility that can withstand 'life on the road'. 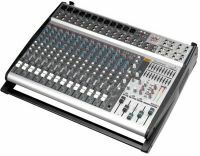 Features include; bridgeable output at 400w,7 input channels compatible with mic/line level(channels 5-7 accept stereo line inputs) 3-band EQ on each input channel, 7-band graphic equalizers, built in limiters. The latest generation of high-powered box mixers is perfect solution for all professional audio applications. Eight balanced mic inputs, ten line level inputs, built in digital effects and three separate 200 watt power amplifiers are combined to offer perfect solution for all manner of PA requirements. 2 outputs can be bridged to give 400w PA with 3rd output giving 200w for foldback. A variation from its twin brother Powerpod 1060 , 1062 provides bigger power output to the main stereo speakers at 300 watts per channel; the power amplifier for stage monitor is taken out, however. A great alternative for people who want more power for main speakers, but don't need power for stage monitoring. The design is based on Powerpod1060, only with more power output and newly designed effect processor. 8 mic/line channels, 10 inputs, packed with 3x270W or 540W mono bridged strong power amplifier. This new box type stereo powered mixer is also built with 3-channel 7-band graphic equalizers and 16-preset DSP effects. A variation from its twin brother Powerpod 1080, 1082 provides 2 channel bigger power output at 400 watts per channel. It's a great alternative for those who want more power for stereo FOH speakers, but don't need extra power for stage monitoring. In addition, one channel power amplifier can be used for mono mix FOH speakers, the other for stage monitors. The new Powerpod1860 offers a killer combination of performance and facilities in a very economical package. With 8 mono inputs and additional 4 stereo inputs, ad 2x300w power the 1860 is perfect for club bands, churches, schools, and wherever a compact and self-contained PA system is needed. Patchable graphic equalizers and power amplifiers offer more flexible utility. The new flagship of Powerpod series, largest and the most powerful powered mixing console. Packed with dual effects: a DSP based multi-effect processor and an adjustable digital delay. Simple, easy to use and effective. 12 mic/line, 4 stereo input channels, tape return, patchable 2 x 10-band graphic equalizer. 2 x 400 watts or 800 watts bridged power amplifier.